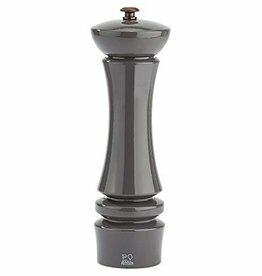 Nancy pepper mill blends traditional and modern styling; 12-inch height. Clear acrylic body allows easy viewing of contents. 2-stage groove system cracks peppercorns before grinding for ultimate flavor. Ball nut on top turns to adjust coarseness of grind. Peugeot Nancy Peppermill - Acrylic - 12"
Peugeot Nancy Peppermill - Acrylic - 8.75"
Beautiful oversized black laquer peppermill is gorgeous on your kitchen and table. Paris stands out from the crowd as the flagship model of the Peugeot collection. Available in black and white laquer 7, 9, and 12". Beautiful white lacquer peppermill is gorgeous on your kitchen and table. Made of beech wood with stylish, classic white lacquer varnish. White provides contemporary design, suitable for both modern and classical kitchens. Do you fancy having an authentic air of French cafés and eateries in your own home? The answer is Bistro, Peugeot's signature model since 1874. Available in black and white for a modern update. Do you fancy having an authentic air of French cafés and eateries in your own home? The answer is Bistro, Peugeot's signature model since 1874. Available in black and white. Peugeot Bistro Saltmill - White Matte 4"